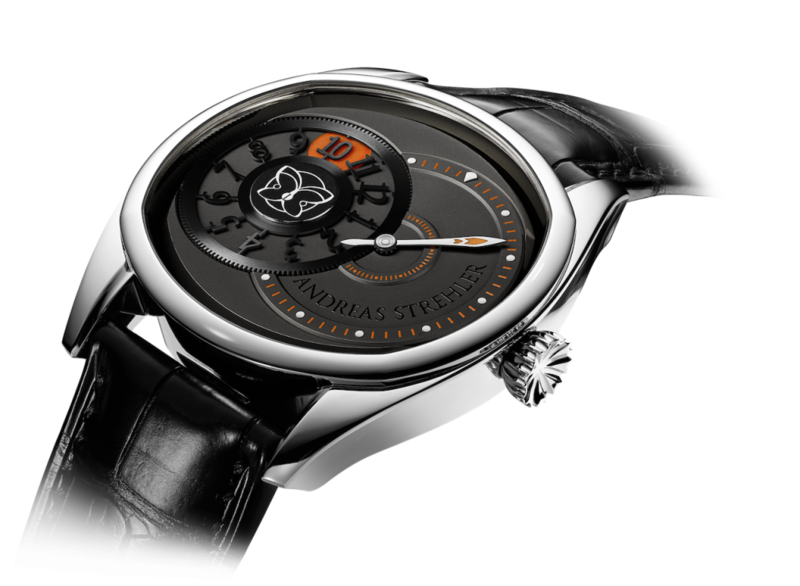 For his eight’s movement to appear in a watch bearing his name, (for other brands, he has designed and constructed many more), Andreas Strehler has designed a watch limited to eight pieces. The indication of the watch is reduced to the two basic indications of hours and minutes, but with a twist. The hours are indicated by a black rotating disk, black like the eight ball in the eponymous pool billiards game. This hour disk, finished in wire-cut, turns around a small disk displaying the typical Andreas Strehler butterfly logo. The actual hour is shown by the cut-out numeral which wanders over a luminous orange dot. This disk is in fact a large gear wheel, linked to the visible gear wheel of the minute hand. The minute hand also has two luminous inlays. Once the minute hand leaves its main minute scale, the minutes can be read precisely from the short part of the minute hand on a smaller secondary minute scale. The minute hand wheel thus directly drives the hour disk. The two gear wheels together form a lying eight which is the mathematical sign for infinity. The movement, as usual specifically designed for the watch, is finished in grainage, the edges of the figure eight shaped bridge with its eight corners are hand-bevelled and are polished by hand. Its 5/8- bridge is designed to emphasise several specific features of Andreas Strehler’s watches: The escapement designed by Andreas Strehler, the true conical gear wheels of the winding mechanism and the large, elegant second wheel. The rarely found grainage-finishing of the main bridge with its fine and rich texture is difficult do adequately reproduce by photography. At the same time technical and warm, it represents the solidity of the construction without taking away from the fineness of handcrafted watchmaking. This surface is difficult to achieve and no mistakes or scratches can be re-polished. The dial of the Andreas Strehler Time Shadow is finished in matt grey, so called blackor, to correspond with the grainage main bridge of the movement. 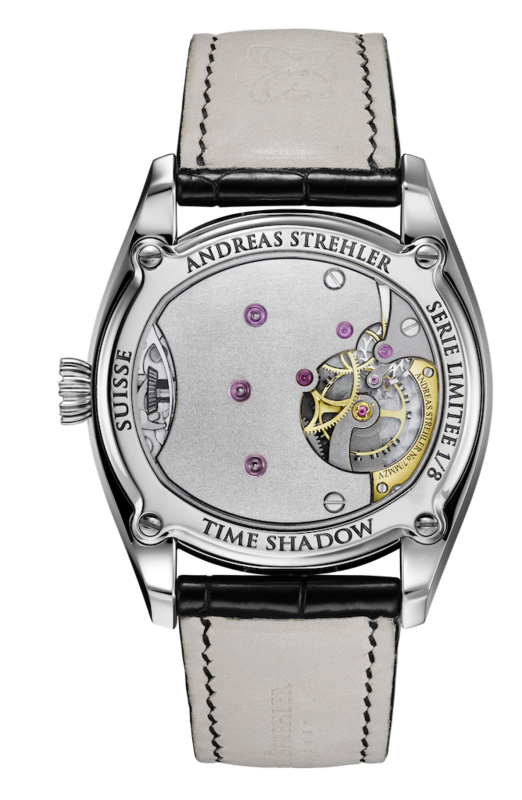 As this movement is also the eighths movement Andreas Strehler has designed and developed for his own line of watches, the Time Shadow is limited to eight pieces.